Being part of the Guinness gong world record was incredibly special. What other community could amass 194 people from around the world in one location? And not just people: we bought our gongs and gong stand, mallets, cushions, other instruments and flags with us form all corners of the globe! The gong world record attempt took place on August 25th and 26th 2018 in the Apex room at Olympia in London. It was the idea of Bob Horwell and he spent much time liaising with Guinness to work out how it could be done. Sarah Waite Aidan McIntyre and Don Conreaux helped with the organisation. Bob needed to gather together at least 150 people for Guinness to consider the record, so the shout out went out on Facebook to see who was interested and who could commit to coming to London. The numbers gradually went up with a sudden surge in the final weeks to bring us up to over 200. In the event we had a few no shows, how on earth could they have found something better to do on that weekend? After everybody had got their gongs into the room and set them up we sat in a circle and Sarah called out the countries people had travelled from and we all applauded and cheered for the worldwide global gong community that had come together as they waved at us. I’ve forgotten them all but people had come from Australia, Hong Kong, India, Argentina, Brazil, Egypt, South Africa, Iceland….. the list went on and on with the UK acknowledged last! The rules from Guinness seemed pretty strict and most of the weekend was spent learning a six minute score of synchronised gong strokes. There were strict rules for the record attempt, we all had to leave the room and be signed in, we had numbers allocated to ourselves and our gongs and the room was a buzz with stewards and adjudicators scrutinising our every coordinated gong stroke! Nobody wanted to be disqualified from the world record! Before the record attempt you could hear a pin drop as the whole ensemble came together in concentration. This was probably the only time there was silence in the room of approximately 200 gongs. In the evenings we held grand gong baths for up to 70 attendees who lay down in the middle of the room in a mandala shape and were immersed in gong sounds, and the loving intention of 194 gong practitioners. You can see a video of the grand gong bath below, thanks to Ladrhyn Bexx for sharing this. There is a long version and a short version. You can watch that video on Youtube here. Here we all are in London but what perhaps was more amazing is that we were joined around the world by the global gong community gonging at the same time. There were many gongers around the world that wanted to be involved but could not get to London so they all synchronised with Greenwich Meantime and played around the world with us. So as one global gong community we were able to send the vibration, sound, resonance, love and intention around the world gonging for world peace. What’s next? We’ve started something big now, we are one big community of gong players wanting to send out more gong love around the world. We are all united in gonging for humanity. I think synchronising around the world to play at the same time and send the heartwarming good vibrations resonating around the globe will be coming soon…..
….. in the meantime you can come to our gong bath much closer to home, check our dates on our events page. Occupational therapy celebrates 100 years in the USA this year, and 100 years in the UK in 2019. I’m from the UK and look forward to learning more about the history of occupational therapy in my country and celebrating all we’ve achieved and our vision for the future. I urge you to find out your country’s occupational therapy history and vision for the future, promote this and celebrate! Even if occupational therapy is fairly new in your country, your country will have an interesting occupational therapy history. Earlier this year my bog What is occupational therapy? went viral with nearly 40,000 views and over 20,000 Facebook shares I found myself at the forefront of promoting occupational therapy. This is not something I had set out to do, but having been catapulted into that position I tried to circulate the post more because occupational therapists and others around the world seemed to relate to my explanations of occupational therapy. Ours is the only profession that promotes meaningful engagement in every day activities, and I believe it is vital that we retain that identity and can articulate why we are the best profession to do that. In the UK, promotion of occupational therapy largely focuses on our role within the National Health Service (NHS). Essentially, this amounts to attempting to reduce NHS costs by either keeping people out of hospital, or facilitating speedier discharges from hospital. In any case the promotion of our role appears to be mainly concerned with saving the National Health Service (NHS) money and keeping people out of hospital. But, I believe, we have a far more profound role in preventative health and supporting people to live well. As occupational therapists we know that our occupations keep us well, give us meaning in life, and motivate us to get up in the morning. Science backs this up. Further, neuroscience research now suggests that occupation has the power to distract us from pain and anxiety. We know this: it is our bread and butter. But we need to make sure other people know. We all know occupational therapy is hard to explain as it is so broad and varied, but we owe our colleagues around the world and the colleagues coming after us to do this. Lets make it easy for ourselves – we just have to explain our role, not all the possibilities of positions and work places for occupational therapy, lets keep it simple for us and our audience. As an occupational therapist I question: 1) what’s the difficulty? 2) why is it a difficulty? 3) how can life be made better? 4) what can we do about it? Can you base your explanation around this? We need to start being confident explaining occupational science too. I feel it’s an historical problem for us that occupational therapy came first and then the science: occupational science came much later. We’re playing catch up, we’re only 100 years old (in USA) and we knew we were on to something before we had the science and the evidence base. Medics took over 2500 years to get their evidence base together. Occupational science was named in 1989. As an analogy, if evidence for medicine has been around for one hour, occupational science has been here for 30 seconds. For every person that doesn’t know what occupational therapy is there are probably many more who have never heard of occupational science. It’s new and it’s exciting, so lets be loud and proud about explaining the value of occupational therapy and it’s underpinning in occupational science. We have the evidence, there is much more to us and our profession than ‘feeling good when we do a hobby’. If other professionals don’t know what we do then our holistic and creative practice and professional integrity is at stake. The more other professionals understand what we do the more likely we are to get more referrals, get more funding and prevent other professionals encroaching on our work. So I urge you to get confident explaining your understanding of occupational science and your role as an occupational therapist so we can promote the profession and protect are uniqueness. Go and add to our history: tell somebody today what you do and the science behind it. What is a gong bath? During a gong bath you are surrounded and immersed in sounds from gongs, singing bowls, conch shell trumpets, shruti box, voice, crystal bowls, rattles rainstick and many other soothing complementary instruments. It’s best to bring a yoga / camping mat, blanket and pillow so that you can lie down and make yourself comfortable. You are then immersed in the sounds and vibrations from the gongs and the other sound healing instruments. The gong is wonderful for creating harmony and balance in our physical, mental, emotional and spiritual selves. The sounds interact with our subconscious, quietening our mind and leading us into an altered stand of consciousness. Towards the end of the gong bath more rhythmic instruments are used to help you to get grounded before going home. There is no water or bath involved in a gong bath. The idea is that you let the sounds wash over you (you are bathed in sound) and by observing and focusing on these sounds, you become more present with the moment, and in turn your mind quietens. The gong bath is a form of sound therapy that goes back thousands of years. The sound of the gong helps the body and brain to relax by going into Delta and Theta brain wave states. Delta brain waves are experienced in a deep dreamless sleep and in very deep meditation. Theta brain waves occur when we are dreaming: vivid imagery, intuition and information beyond normal consciousness awareness. These brain waves are know to support relaxation, creativity and natural healing. Our brain waves change according to what we are doing and feeling. When we’re busy, thinking and alert our brain waves are Gamma and Beta. As we all spend so much time on our phones and tablets we are always in a state of alert, we’re waiting for incoming messages from a variety of platforms. It’s hard to shut off from the virtual world and be present in the here and now. We need to invest in time to relax and put the effort into making this happen. A gong bath is an ideal opportunity to put your screen down for an hour, get into your body and brain in the present moment, relax and just be. This type of relaxation can activate the vagus nerve. The vagus nerve seems to be getting a lot of good press lately. It is the longest nerve in the body: it starts in the brain and passes through the digestive system, liver, spleen, pancreas, heart and lungs. So the heart, guts and brain all communicate via this nerve, which is why we feel emotion in our stomach. It plays a large part in the parasympathetic nervous system which is the ‘rest and digest’ system. The sympathetic nervous system is our ‘fight or flight’ system, and puts us in states of alertness and anxiety. When we are relaxing, our natural healing and repair systems work in conjunction with the parasympathetic nervous system. So, by activating the vagus nerve at a gong bath you can have a positive influence on your own immune system, health and wellbeing. Therefore, the role of the brain on the body can have a profound effect. From the Harp are now providing regular gong baths in Portsmouth and Southsea, why don’t you come along and try one? Please check our Events Page page and From the Harp’s Facebook Page page for our gong bath events. Booking is advisable. My clients often expect me to turn up with a large harp, the sort of harp you see in an orchestra, they are often wondering how I’m going to get it in the building, and they are surprised when I arrive with my small therapy harps. Many people have not seen this type of harp before. Therapy harps are very different to the orchestral harp. The concert harps have seven pedals around the bottom that are used to change the key so players need very good hand and foot co-ordination. It means they have more scope to play tunes in different keys, but they’re not practical for my type of work. The therapy harp has been around since the 1970s, and is basically a small harp, and can be called a small harp or a lap harp or a therapy harp, it’s basically the same thing. Some of them have levers at the top which enables the player to change the key. The therapy harp is light weight and can be worn with a strap which enables the harp to be played while walking around, which is perfect for bringing music to people in a large lounge especially if they may have visual or hearing impairments. A colleague in the therapeutic harp community from America plays using a strap and walks around hospital corridors allowing the live harp music to float into many rooms and nursing stations, bringing the music to more people. The music changes the atmosphere and can bring a bit of release to patients and loved ones dealing with hospital admission and treatment. Such light weight harps can be played in bed, in wheelchairs and on the floor, so they are really accessible and the way of playing can be adapted to meet the clients physical abilities. Playing the harp on the floor works really well with young children, and playing in bed is great for anyone that is unable to get out of bed. These harps are ideal for harp circles too, where a group of people create music together. I have a choice of straps and knee sticks to stabilise the harp, so players in my harp circles can choose how they would like to position the harp in the way that is most comfortable for them. The harp rests on the shoulder and is either supported by the strap of the knee stick, it’s light and allows the player to easily reach all the notes on the harp. Harp circles are inclusive, they enable participants to be able to do one little part and be part of a whole group making music. They are uplifting, enjoyable and accessible allowing everyone to take part in some way regardless of challenges or ability. Harp playing can relax, energise and sooth and can contribute to healing for the youngest of children to the oldest of adults. Music releases emotional pain, increases interaction, builds self esteem, improves short term memory and attention span, and relieves stress. Harp circles allow people to enjoy making music, there is no right or wrong way, and we are all musical, there is no wrong note. 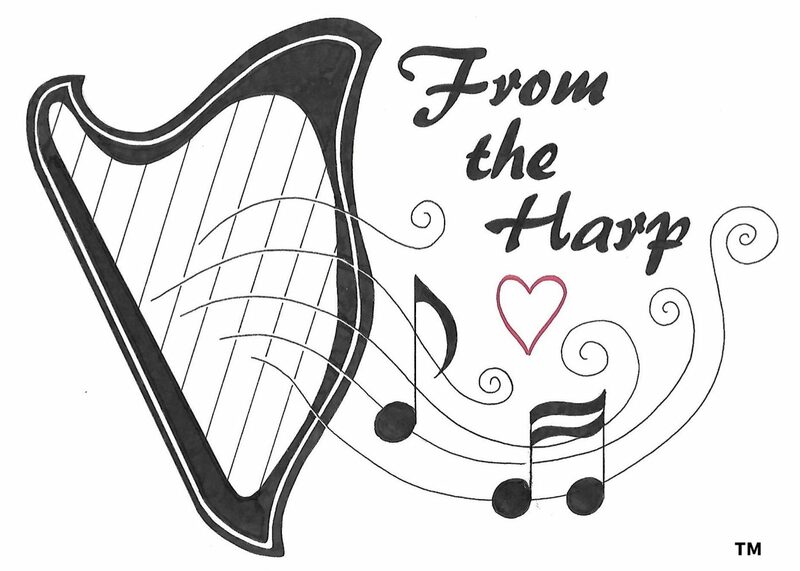 Harp circles can incorporate different goals, somebody who has just had a stroke and is able to get their hand to the harp and play a note has achieved. Somebody who has a brain injury and is able to concentrate and take part in the group is successful. Everybody has different goals and outcomes, but everybody plays a little bit and we create a whole tune together. Please get in touch to discuss your clients’ requirements.